The beauty that is gardening in Venice. You will be thinking of finding your way amongst the crowds when you come to Venice in August. Looking somewhere for refreshing shade and quiet. But even in the center of town, along those beaten paths, there are secret oases of verde rigoglioso – lush green private gardens. Not just the semi-private corti – courtyards of houses you can cross or look into. I mean the little gardens, off-limits, hiding behind the walls. 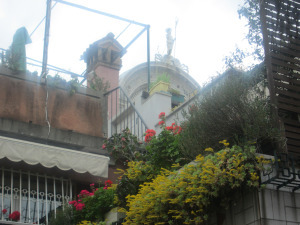 Almost one-third of Venice consists of these little secluded, private gardens.